On a recent roadtrip to explore parts of Northern New South Wales, Pete picked up a jar of pickled onions aptly called ‘Bum Hummers’. The byline on the jar reads ‘1000 farts in every jar’. Pete found the humour in this, a typical male thing I suppose? As you can see they have barely lasted long enough for me to take a photo of them! They are made by a company called Riverina Grove who manufacture a range of gourmet food products including sauces, pickled onions, olives and salsas. 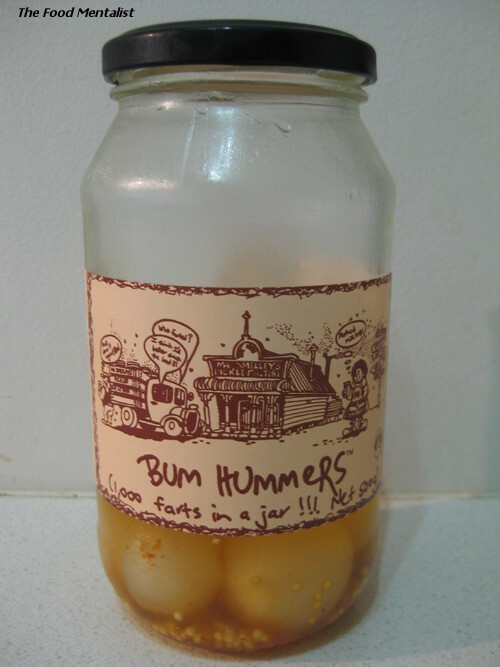 The Bum Hummers are part of their ‘novelty’ range. As far as pickled onions go they are quite nice. They have just the right amount of crunch and crispness and a hint of spice from the addition of chilli and mustard seeds. 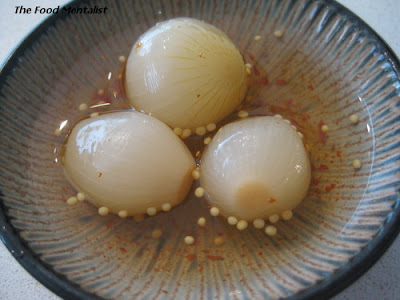 They also have that distinctive tangy sweetness that pickled onions are known for. I find they are best served alongside cold meats and cheese or cut up in a sandwich. If you prefer, you can just eat them straight from the jar, a la Pete style. Pickled onions are very popular in parts of the United States, Hong Kong, Switzerland and in the UK where they serve them alongside fish and chips or as part of the traditional Ploughmans lunch. I remember eating them as a child cut up on a sandwich with ham, cheese and mustard pickles. You may have also seen 'cocktail onions' which are a smaller pickled onion coloured red or green. Pete’s amusing purchase got me thinking. I wonder what other unusual foods or quirky named food products are out there? What is the most unusual ingredient or oddly named food product you have ever purchased? He and Pete would get along well, I think!